Air bubble construction guards against bursts or punctures. 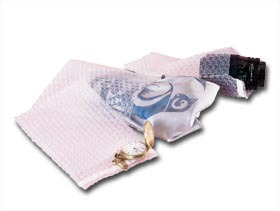 Ensure the best protection of delicate items, sensitive components or glassware. Superior cushioning ability with superior strength. Smooth insides for easy use. Bubbles outside for non-slip handling. Sealable with pull-away pressure sensitive adhesive tape. FDA approved. FOB Shipping Point. Product No. Size Bags Per Case Wt. (lbs.) Ca. Price Per Ca. Ships UPS Dimensional Weight. Please order case quantities only.